Most people would imagine the 30-days Ignatian retreat to be a peaceful experience, a quiet break from the hustle and bustle of life. Well, for those of you who have gone through this retreat, you would understand what I mean when I say that it actually felt like running a marathon. Just into the last week of my retreat, feeling worn out by an ongoing battle with self-doubt, confusion, and personal issues, I was beginning to experience some moments of peace and see light at the end of a long dark tunnel. I thought that there would be no more surprises, but then came the night! It was the night that almost broke me and yet ironically remade me. I was overwhelmed and even paralysed by inexplicable fear and guilt. Was I being an unfilial son, turning my back on my parents? Was the Church ready for another broken priest? Would I be able to commit myself to the life-long ministry of the priesthood with all its challenges, so much of it still uncertain? In trying to find an answer to these troubling questions, I sank into a mire of despair. There seemed, at that time, to be only one solution - to return to Malaysia, see my bishop and tell him of my decision to leave. Perhaps apologise and even offer to repay the cost of my formation in installments. I finally succumbed to sleep after a weary night of tossing and turning, barely holding on to a tiny lingering hopeful thought – ‘Tomorrow will be a new day’, I told myself. Maybe things will look different, they so often do. When I woke up the next morning, the sun was already out. The birds were chirping (literally) and I could smell the fresh morning air wafting into the room. It was as if the whole night’s battle was just a dream or a nightmare. I woke up with a clear and un-convoluted head, a clear resolve to become the priest that God had called me to become and there was no turning back. I had passed the test. I must admit that this would not be my last. Every day, we are confronted by decisions, whether major or trivial. Some are easy: Vanilla or chocolate ice cream? But many decisions can be quite life-altering, for yourself and possibly a host of others. How do we come to a decision? Well, it’s never easy. They don’t really teach you these techniques in school and you often have to just trust your own gut instincts. Men take pride in attempting to find a solution on their own, whereas women would convene a town hall meeting to brainstorm. Some of us hate making decisions so much so we try to get other people to make them for us. We corner all our friends, family members and even the Parish Priest and ask them what we should do. Then, when their decision turns out to be a disaster – we go back to these people and blame them for all our troubles. Procrastination is another common way of avoiding decision-making. Quite often if you put off making a decision long enough – it eventually gets made for you. Some people don’t make decisions – they just react; they base their decisions on impulse and later, live to regret it. In this last week of Advent, our attention is drawn to St Joseph, a man who barely gets mentioned anywhere else in Scriptures and when he is mentioned, he is given no words to speak. Joseph had a gut-wrenching decision to make. And the story of Christmas, hangs on this very decision just like it hung on the decision of Mary at the Annunciation. Upon the discovery that she was with child, the paternity of the child unknown, he was faced with a dilemma: is he to marry Mary or not to marry her? There is the potential for a public spectacle, humiliation to himself, and even the loss of life for Mary. We are bombarded with the sanitised and picture-perfect portraits of the Holy Family that we forget the very real human struggles behind them. If he married Mary, he would, either admit to being the baby’s father (a dishonourable option) or he would be shamed by her “indiscretion.” If he chose to divorce Mary with charges of adultery, he would put her life in danger because adultery was punishable by death. But, if he divorced her without charges of adultery, he could possibly save his reputation and save Mary’s life by shaming the “real” father into marrying her. That is the decision he settled on. Being a carpenter, a literal Mr. Fix-It, Joseph believed that he could fix this mess. Typically like other men, he chose to solve the problem quickly and singlehandedly on his own. However, before he acts on it – he sleeps on it! And as he sleeps, God, like magic, begins to work. Is it possible that going to sleep can be an act of faith? I would like to remind the congregation that sleeping in church doesn’t count. So, please don’t get any funny ideas. But in the case of St Joseph, it is. Our Holy Father, Pope Francis said this of St Joseph, patron of the universal Church: “Sleeping, he looks after the Church.” “Joseph’s rest revealed God’s will to him.” Sleep is a form of surrender, an admission that we do not have all the answers, a recognition that only God can point us in the right direction. To surrender to sleep is to admit that it is not always possible for us to fix things or problems. The irony is clear: you have to provide the space where God enters, and, like how the body and mind cede all their rights to the night in sleep, one must surrender to the will which is greater than our own fragile and weak will. It is only when all our defenses are down, when our ego is dethroned, then and only then are we ready to listen. The gospel tells us that Joseph slept and he dreamt; and in his dream, the Lord helps him to see everything in perspective. Joseph may have lost his own big dreams but then he discovered, God’s greater dream for mankind, the salvation of humanity. Joseph would eventually choose the path that would earn him honour from God by risking dishonour in the eyes of his family and friends. Fear comes solely from the knowledge of our weaknesses and limitations. Had we been omnipotent, if we shall not die, there is absolutely nothing to fear. But the message of Joseph, so silently delivered with eyes closed, is that one can always find rest. Not to escape our fears, not to cowardly suspend time for a while and never to simply attain the bliss of forgetting what may trouble us. No, we can rest because there is Someone who never sleeps—Someone to take care of what we have to leave for a while, to guard us, and to be a light in the night. Just as a child is able to sleep soundly because he knows that his mother watches over him. Man sleeps, yes! but God never sleeps....... And only God can truly fix what has been broken beyond repair. That is our greatest consolation and strength. 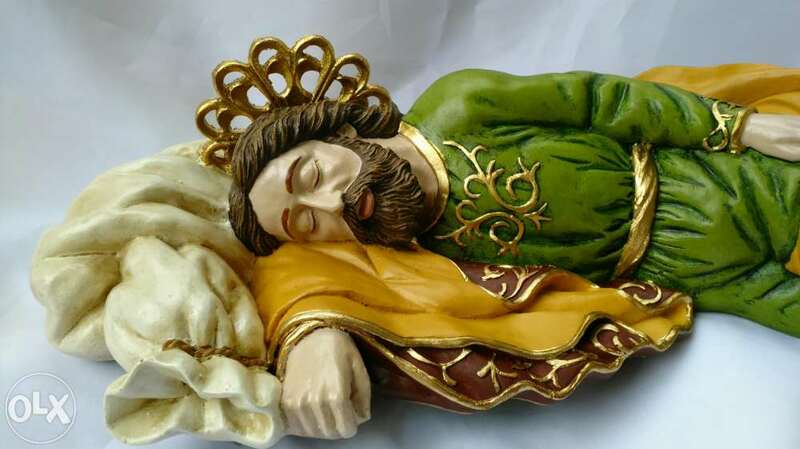 So, as I continue to struggle with my self-doubts and confusion, my fatigue and fears, I look at the little figurine of St Joseph lying down asleep on my office desk, I know St Joseph wishes to remind me: God is with me in my doubt, my fear, the mess and complexity. God is with us. Emmanuel. We are called to silence our own incessant minds, fretting over various problems, screaming out numerous instructions and solutions, so that we may listen again within the silence and the depth of our hearts to the only voice that matters. With a welcoming heart and listening ear, with the assurance that God would not abandon us, even in the darkest and most arid moments of our lives, we can look fear and paralysis directly in the eye. And choose to trust Him over and over again.